Do you want to win something for all the hard work you have put in for your websites or blogs? 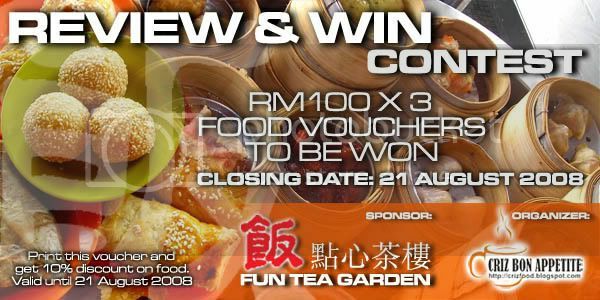 Here is the opportunity for you to win RM100 worth of food vouchers for your next visit to Fun Tea Garden. The rules are rather simple. Just blog about the Dim Sum shop in Penang and leave your name and post link in the Mister Linky’s attached and the panel of judges will get back to you if you are a winner. There will be THREE RM100 worth of vouchers to be won. The closing date for the contest is on 31 AUGUST 2008. GREAT NEWS: Effective 4 August 2008, Fun Tea Garden would be extending its business hours to 12 hours a day, from 12.00 midnight until 12.00 noon. This contest is open to all non-Muslim Malaysian bloggers, especially those around Penang area. You will need to pay a visit to the Fun Tea Garden Dim Sum shop (address and location map as in the link above) anytime between 12.00 midnight and 12.00noon daily and shoot whatever photos you deemed right and blog about it. You can print and use the voucher above to claim your 10% discount. Make sure you write your NAME, EMAIL and BLOG ADDRESS behind your printout. Sign in your NAME and POST LINK CORRECTLY in the Mister Linky’s attached once you have posted the review for easy tracking. The review can be in either ENGLISH or MANDARIN. Photographs must be originals. Anyone found to have copied from others would be disqualified. There are no restrictions to how many websites/blogs reviews you can submit but ONLY ONE would be awarded the prize. Closing date will be before midnight on 31 AUGUST 2008. Results would be announced here on 8 SEPTEMBER 2008. All winners would be contacted by email. The organizer and sponsor reserved the right to publish any photos submitted for contest publicity purposes. The panel of judges’ decisions would be final and no correspondences would be entertained. 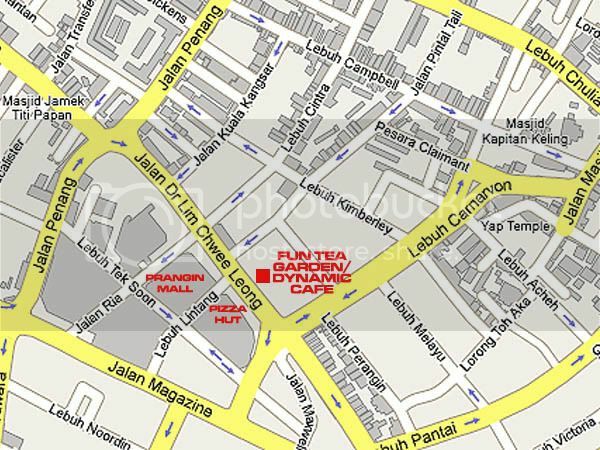 sorry, i coudnt find any link and address in your post…where is the Fun Tea Garden located? Ya. In fact this morning, I was clicking here and there to find the map.